i see what you're trying to do with your troll about the Korherr report but it doesnt really work. When multiple people, perpetrators and witnesses, describe how Belzec and Treblinka etc was a death camp, and their stories corroborate each other, and the structures being buried is corroborated, and theres ash and remains, but you find a couple of accounts (oh no, sorry, not 'you') that contradict whether it was a gas or a diesel engine - well then its time to "dismiss" (meaning throw out) everything, cause you think the Jews fcked up that one part about the story so the whole thing was fake! Transit camp! lol. korherr report doesnt help your position it only serves to corroborate the numbers of the Holfe telegram meaning how many Jews went into those 4 camps up until december '42 and never left. The corroboration is due to Soviet activity. The NKVD the Russian equivalent of the SS coerced people into making the claims. This was an intense systematic political fraud. It is a indisputable fact that you have yet to present any empirical evidence that so-much-as one of the alleged remaining 97 "scientifically proven huge mass graves" contains the remains of so-much-as 7 people. Now let's get back to applying some more common sense to this issue. I'll chose one of the remaining alleged 97 "scientifically proven huge mass graves" and we can discuss your alleged "*some* archeological evidence" allegation to the test. Unless of course you don't want to because you're afraid that your "magically disappearing jew theory" will not hold up to skeptical inquiry. I"m more than willing to talk about the millions upon millions of magically disappearing bones and the tens of millions of magically disappearing teeth. You've still got the remains of 1,999,994 people to account for laststarfighter. From late 1997 until early 1998, a thorough archaeological survey of the site was conducted by a team led by two Polish scientists including Andrzej Kola, director of the Underwater Archaeological Department at the University of Toruń, and Mieczysław Góra, senior curator of the Museum of Archaeology and Ethnography in Łódź (pl). The team identified the railway sidings and remains of a number of buildings. 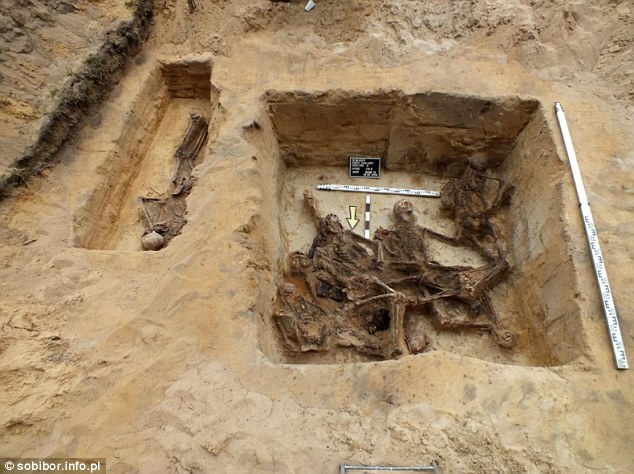 They also found 33 mass graves, the largest of which had an area of 480 m2 (5,200 sq ft) and was 4.8 m (16 ft) deep. The total volume of these mass graves was estimated at 21,000 m3 (740,000 cu ft). Air photo analysis suggests that these 33 mass graves were not the only graves at Belzec extermination camp. All graves discovered by archaeologists contained large amounts of human cremation remains, and 10 graves also contained unburned human remains, which Prof. Kola described as follows: "Deposition of corpses in the water-bearing layers or in very damp structure of the ground just above that layer, with the difficulty of air penetration, because of the depth, caused the changes of the deposited bodies into wax-fat mass. In some graves the layer of corpses reached the thickness of ca 2,00m." See the first quote from you above. You're the one who has brought up the issue of "10 graves containing unburned human remains" at Belzec. Let's talk about them - unless your too scared to hold your "magically disappearing jew theory" up to skeptical inquiry. Of the 10 alleged Belzec graves that you allege contain unburned human remains - the one that you can prove currently contains the most human remains - is number: __?__. the belzec victims are ash, according the official story. Kola does not say "ash" - he says, according to you, "human cremation remains" - which would mean tons of bone fragments and millions of teeth - IF - your fantasy is actually true. What are you waiting forlaststarfighter? theres ash and remains... many Jews went into those 4 camps up until december '42 and never left. And according to you, they were "resettled" into 100 "huge mass graves." laststarfighter, of the 100 alleged graves / cremation pits of Belzec, Chelmno, Ponary, Sobibor and Treblinka II in question - the one that you can prove currently contains the most human remains - is number: __?__. It must be number 101 one of the graves they havnt found yet. Kola the Clown with his manually operated coring bits and his little hand drawn pictures of his "results" along with summaries from Wikipedia and laststarfighter accuses Nisco of spamming. lol. I come back and laststarfighter is still spamming. He can't substantiate the so-called "archeological investigation reports" that he quotes - so he just spams. We're still waiting for laststarfighter to substantiate the unsubstantiated allegations made in the fraudulent reports he keeps spamming. I'll chose one of the remaining alleged 98 "scientifically proven huge mass graves" (that allegedly contain the remains of 2.2 million people) and we can hold his so-called "archeological investigation reports" up to skeptical inquiry and the scientific method. Unless of course he doesn't want to because he's afraid that his insane "magically disappearing jew theory" will not hold up. Now let's start by using laststarfighter's answer to this question. laststarfighter - Of the 100 alleged graves / cremation pits of Belzec, Chelmno, Ponary, Sobibor and Treblinka II in question ( http://nafcash.com/ ) - the one that you can prove currently contains the most human remains - is number: __?__. And his answer is - ?